I know a lot of daycares provide lunches, but as a vegetarian, I was really happy to find out the school we sent Little Pea to doesn’t—no worrying about things getting awkward when she can’t eat the hot dogs or bologna or whatever other meaty things they’re serving up. 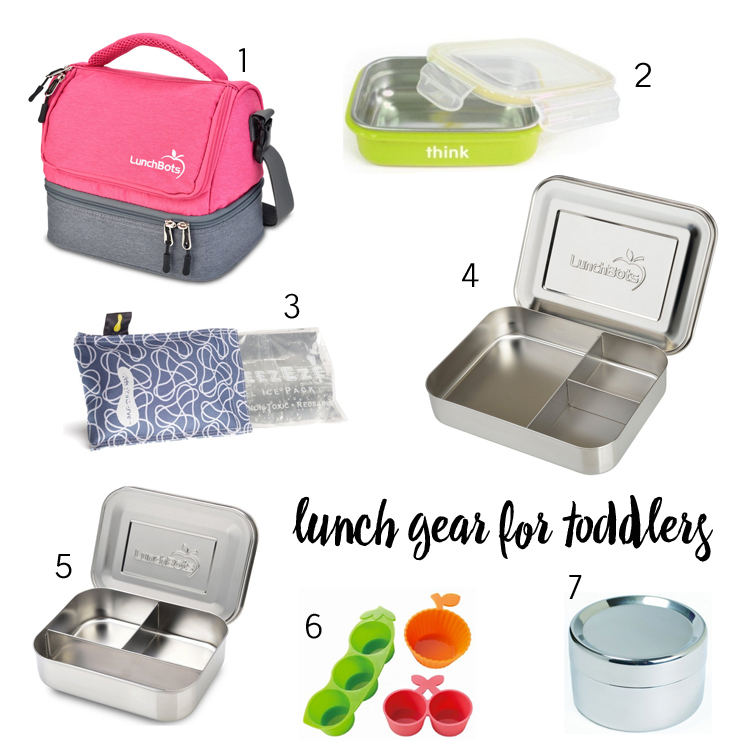 Have you tried to find a lunchbox that accommodates a bento box and is insulated too? it’s pretty hard! I found so many adorable lunch boxes and bags, but they’d all tip the bentos sideways, which would be no bueno. This lunch bag isn’t so adorable, but it’s designed to tote bento boxes and it has 2 compartments, perfect for sending something cold in one compartment and warm in the other. Learn more + buy it here. This is a smaller box, but it’s good when I’m sending something to school that’s more of a one-dish meal, like a pasta salad with cheese and vegetables. Although the outside is (BPA-free) plastic, the inside where the food touches is stainless steel. I love that this ice pack doesn’t sweat all over the lunchbox. Little Pea comes home at noon and the ice pack is still cold when I unpack her stuff, so it stays cold for at least 5 hours. At first, I started with the smaller LunchBots bento, but Little Pea likes sandwiches and I worried they wouldn’t fit, so I bought the bigger version too. LunchBots come a variety of compartment configurations, but I think 3 is perfect—it fits a variety of foods, but not so many that I have to struggle to think of what to fill each space with. This is our most-used bento. I love this thing. It’s the perfect size for toddler lunches. I didn’t want to use plastic bentos or food containers and LunchBots have been working out well for us. Little Pea loves dipping (or “dip dip dip,” as she calls it), so I bought these for sauces. But after she came home from school with her shirt completely covered in ketchup, I decided these might be better used for holding small pieces of cheese and fruit. If I’m sending lunch in the thinkbaby bento, I’ll put fruit or quartered cherry tomatoes in this container.